Puerto Maldonado is a small town in the southern Peruvian Amazon that’s just a half-hour plane ride from Cusco. 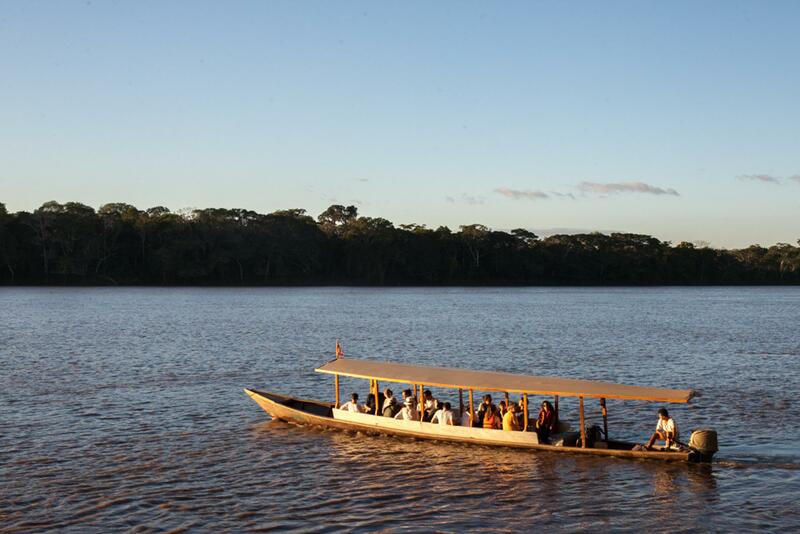 The nearby lodges offer travelers an accessible and affordable experience in the Amazon. Puerto Maldonado is a wonderful option for travelers who have a limited time frame or budget. It’s easily reachable from Cusco and has quality lodges in the surrounding jungle. Visitors have a good chance of seeing wildlife, including monkeys, birds, caimans, turtles, and capybaras. Two protected areas spread out around Puerto Maldonado. The Reserva Nacional Tambopata is a 679,500-acre (275,000-ha) reserve that protects the rainforest all the way to the Bolivian border. It acts as a buffer zone around the Parque Nacional Bahuaja Sonene, which is almost 2.5 million acres (1 million ha) large. The jungle lodges are set in two main areas along the edge of the Reserva Nacional Tambopata. One group is about an hour’s boat ride down the Río Madre de Dios from Puerto Maldonado. The other group is about 3 hours up the Río Tambopata. When visitors arrive at the airport in Puerto Maldonado they are typically picked up by their lodge and transported up a river by motorboat. The lodges here are comfortable and provide travelers with intimate access to the Amazon rainforest. Most offer trips and activities, including bird watching, piraña fishing, and nature walks. Prices usually include transportation, lodging, and food. Puerto Maldonado initially developed as a result of the rubber boom in the early 20th century. After the rubber boom ended, logging and gold mining became the dominant industries—these industries continue on today, although tourism is beginning to play an increasingly important role. The city’s name is actually the result of two explorers who both had the same last name of Maldonado and explored the Río Madre de Dios. Juan Álvarez Maldonado was a Spanish explorer who came here in 1567 on a hunt for gold. He made it to the Río Heath, the present-day Bolivian border, but lost over 200 men and returned to Cusco several months later half-crazed and claiming to have found a wealthy city in the jungle. Several centuries later, Colonel Faustino Maldonado returned to the area with the goal of mapping out the region. He died along the Río Madre de Dios, but carved his name on a tree at the junction of the Madre de Dios and Tambopata Rivers, which is where the town is now located. "we absolutely loved this part of the trip!" we absolutely loved this part of the trip! The open-room, but luxury feeling lodge exceeded our expectations. Excellent experience, designed to put city dwellings in touch with the jungle, but still keeping the safety. So much fun to arrive and be taken off to the jungle in a covered canoe. The office of Rainforest Expeditions made our wait for our bus ride to the river very comfortable. They made the whole check in process very easy. It's a small place but it allows for easy access to the jungle which we were very excited to experience. Refugio Amazonas was the most amazing place to stay and experience the jungle in a safe and first class environment.